The Republic of the Marshall Islands (RMI) is a collection of 1,225 islands and islets spread out over an exclusive economic zone of nearly 1 million square miles. RMI is an affiliate member of the U.S. All Islands Coral Reef Committee (AIC). *Download 1-pager: 1-pager about RMI (PDF 2.7MB). 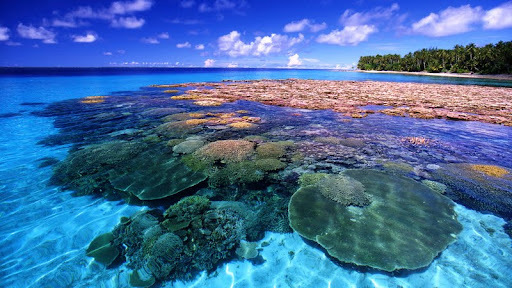 Overall, the coral reef ecosystems of the Marshall Islands are in excellent condition, particularly those in the outer, less populated atolls. Marshall Islands reefs support healthy and diverse communities of marine life. These reefs are important to the people of the Marshall Islands, where conservation and sustainable resource management are a part of their culture. Coral reefs in the Marshall Islands have become increasingly threatened by climate change, sea level rise, fishing pressure, increased urbanization, and loss of cultural traditions. Coral reefs closer to areas of higher population are impacted by fishing and pollution more than in other parts of the RMI. However, threats such as coral disease, pollution, and overfishing are fairly low compared to other areas of Southeast Asia and the Pacific Islands. In RMI, coral reef management is led by the Coastal Management Advisory Council, an inter-governmental, non-governmental group led by the Marshall Islands Marine Resources Authority, which includes organizations such as the College of the Marshall Islands and the Marshall Islands Conservation Society. Publication of the “Facilitator’s Guide to Implementing the Reimaanlok Conservation Planning Process” – The Field Guide was developed to fill the need for a conservation area planning framework and “develop principles, process, and guidelines for the design, establishment, and management of conservation areas that are fully owned, led, and endorsed by local communities based on their needs, values, and cultural heritage.” Download a copy here. Establishment of a Shark Sanctuary – An amendment to the RMI Fisheries Act was passed by the Parliament in October 2011, resulting in a ban on all commercial shark fishing within the Marshall Islands EEZ. This created what was, at the time, the world’s largest shark sanctuary. Enforcement of this law is an ongoing effort and to date five vessels have been fined over $150,000 for possession of shark fins. Learn more about this effort here. Completion of the Fourth Marine Conservation Certificate Program – in 2013, there were 29 participants in the program, representing 17 different atolls, and 21 completed the entire course. This program is designed to build that capacity within local conservation resource and agency people. The goal of the program is to have trained personnel able to educate others, monitor and collect data, and the enforce regulations. The course has been offered yearly since 2009. Learn more about this program here.